The great Kurt Vonnegut, Jr passed away yesterday at the age of 84. He will be missed, but we are lucky enough to have his books to read all over again. The following homage is from the Associated Press, written by Cristian Salazar. NEW YORK -- In books such as "Slaughterhouse-Five," "Cat's Cradle," and "Hocus Pocus," Kurt Vonnegut mixed the bitter and funny with a touch of the profound. Vonnegut, regarded by many critics as a key influence in shaping 20th-century American literature, died Wednesday at 84. He had suffered brain injuries after a recent fall at his Manhattan home, said his wife, photographer Jill Krementz. In a statement, Norman Mailer hailed Vonnegut as "a marvelous writer with a style that remained undeniably and imperturbably his own. ... I would salute him -- our own Mark Twain." "He was sort of like nobody else," said another fellow author, Gore Vidal. "Kurt was never dull." Vonnegut's works -- more than a dozen novels plus short stories, essays and plays -- contained elements of social commentary, science fiction and autobiography. Hours after his death, "Slaughterhouse-Five" had jumped to the top 10 on Amazon.com, while "Cat's Cradle" and the nonfiction "A Man Without a Country" had reached the top 40. Vonnegut's longtime friend and manager, Donald Farber, said there would be no public memorial, only a private gathering of family and friends. 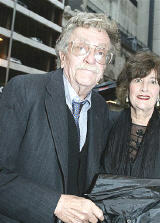 He also said that other Vonnegut books were likely to come out, but declined to offer specifics. 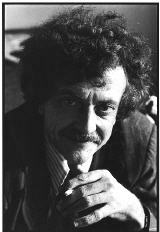 A self-described religious skeptic and freethinking humanist, Vonnegut used protagonists such as Billy Pilgrim ("Slaughterhouse-Five") and Eliot Rosewater ("God Bless You, Mr. Rosewater") as transparent vehicles for his points of view. Vonnegut lectured regularly, exhorting audiences to think for themselves and delighting in barbed commentary against the institutions he felt were dehumanizing people. "He was a man who combined a wicked sense of humor and sort of steady moral compass, who was always sort of looking at the big picture of the things that were most important," said Joel Bleifuss, editor of In These Times, a liberal magazine based in Chicago that featured Vonnegut articles. Like "Catch-22," by Vonnegut's friend Joseph Heller, "Slaughterhouse-Five" was a World War II novel embraced by opponents of the Vietnam War, linking a so-called "good war" to the unpopular conflict of the 1960s and '70s. Some of Vonnegut's books were banned and burned for alleged obscenity. He took on censorship as an active member of the PEN writers' aid group and the American Civil Liberties Union. The American Humanist Association, which promotes individual freedom, rational thought and scientific skepticism, made him its honorary president. Vonnegut said the villains in his books were never individuals, but culture, society and history, which he said were making a mess of the planet. "I like to say that the 51st state is the state of denial," he told The Associated Press in 2005. "It's as though a huge comet were heading for us and nobody wants to talk about it. We're just about to run out of petroleum and there's nothing to replace it." Despite his commercial success, Vonnegut battled depression throughout his life, and in 1984, he attempted suicide with pills and alcohol, joking later about how he botched the job. "I will say anything to be funny, often in the most horrible situations," Vonnegut, whose watery, heavy-lidded eyes and unruly hair made him seem to be in existential pain, once told a gathering of psychiatrists. Vonnegut was born on Nov. 11, 1922, in Indianapolis, and studied chemistry at Cornell University before joining the Army. His mother killed herself just before he left for Germany during World War II, where he was quickly taken prisoner during the Battle of the Bulge. He was being held in Dresden when Allied bombs firebombed the German city. "The firebombing of Dresden explains absolutely nothing about why I write what I write and am what I am," Vonnegut wrote in "Fates Worse Than Death," his 1991 autobiography of sorts. But he spent 23 years struggling to write about the ordeal, which he survived by huddling with other POW's inside an underground meat locker labeled slaughterhouse-five. The novel that emerged, in which Pvt. Pilgrim is transported from Dresden by time-traveling aliens, was published at the height of the Vietnam War, and solidified his reputation as an iconoclast. After World War II, he reported for Chicago's City News Bureau, then did public relations for General Electric, a job he loathed. He wrote his first novel, "Player Piano," in 1951, followed by "The Sirens of Titan," "Canary in a Cat House" and "Mother Night," making ends meet by selling Saabs on Cape Cod. Critics ignored him at first, then denigrated his deliberately bizarre stories and disjointed plots as haphazardly written science fiction. But his novels became cult classics, especially "Cat's Cradle" in 1963, in which scientists create "ice-nine," a crystal that turns water solid and destroys the Earth. He retired from novel writing in his later years, but continued to publish short articles. He had a best-seller in 2005 with "A Man Without a Country," a collection of his nonfiction, including jabs at the Bush administration ("upper-crust C-students who know no history or geography") and the uncertain future of the planet. He called the book's success "a nice glass of champagne at the end of a life." Vonnegut, who had homes in Manhattan and the Hamptons in New York, adopted his sister's three young children after she died. He also had three children of his own with his first wife, Jane Marie Cox, and later adopted a daughter, Lily, with his second wife, Krementz. Vonnegut once said that of all the ways to die, he'd prefer to go out in an airplane crash on the peak of Mount Kilimanjaro. He often joked about the difficulties of old age. "When Hemingway killed himself he put a period at the end of his life; old age is more like a semicolon," Vonnegut told the AP. "My father, like Hemingway, was a gun nut and was very unhappy late in life. But he was proud of not committing suicide. And I'll do the same, so as not to set a bad example for my children."